Leonardi reviews Giorgos Kallis’ new book “In defense of degrowth”, a volume that provides activists and academics alike with a detailed map of the degrowth discourse, with its theoretical controversies and opportunities for political alliances to come. What struck me first and foremost in the process of reading In defense of degrowth was its dialogical attitude. Coming from a Marxist environment – where self-referentiality and a certain selectivity in choosing interlocutors are still present – this was pretty awkward at first but eventually quite pleasant. Sure, there is determination and assertiveness when it comes to argue for basic degrowth ideas and policy proposals. However, page after page one feels a tacit invitation to discuss conceptual and practical issues without having either to fully agree or to leave the table. 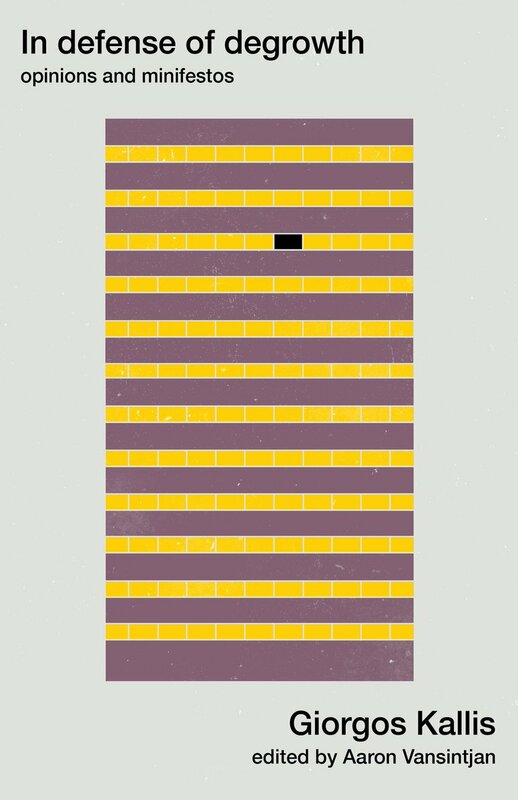 In this sense, rather than a monolithic diagnosis with a consequential blueprint for the new society, degrowth resembles a field of tensions originating from a relatively small set of assumptions. These assumptions are that social metabolism must shrink equitably; that growth as pillar of the contemporary imaginary must be challenged; and that capitalism as defined by the accumulation-imperative must be overcome. After all, it is perhaps more accurate to talk about one degrowth trajectory – from France to Italy in the early 2000s, then from its Catalan re-working to the current global stage after 2010 – that has declined and been re-shaped in multiple ways. 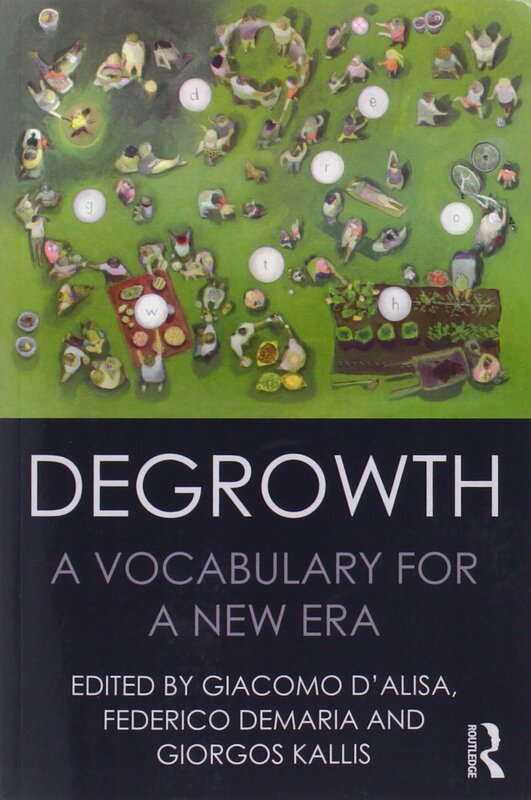 In my opinion, this book, as well as the Introduction & Epilogue of Degrowth: A Vocabulary for a New Era, written by Giorgos Kallis with Giacomo D’Alisa and Federico Demaria, defends a perspective that has assumed two important elements. First, degrowth is nowadays not only a rising social movement but also a legitimate academic research agenda – hence the juxtaposition to a majority of short political pieces of a few, relatively longer and denser theoretical elaborations. Second, there is a shift of emphasis from sustainable degrowth as “equitable downscaling of production and consumption that increases human well-being and enhances ecological conditions” (p. 10 – see also Schneider et al), to “[a] commitment not just to protect nature or to manage or mitigate the impacts of capitalism, but also to create an alternative social ecology and a fundamentally different basis for action” (p. 25). I do not mean to suggest that a focus on different substituted the insistence on less. Kallis himself made this point very clear in the roundtable on the Vocabulary at the ENTITLE Conference Undisciplined Environments, held in Stockholm last year: “I always feel there is a need for saying something about ‘less’ too – slowing down, producing and consuming less […] I think it is crucial in our definitions to keep the idea that production and consumption should and will decrease, the question is how to redistribute this equally, and make sure that everyone has access to a decent standard of living that is attainable with the resources that we currently have”. However, the new interest in a metabolism which needs to be smaller but above all different – and the idea that such difference can be achieved only through political struggles carried by social movements within as well as without existing institutions – significantly widened the audience for the degrowth discourse, most notably by including anti-capitalist radical traditions such as Anarchism and Marxism. 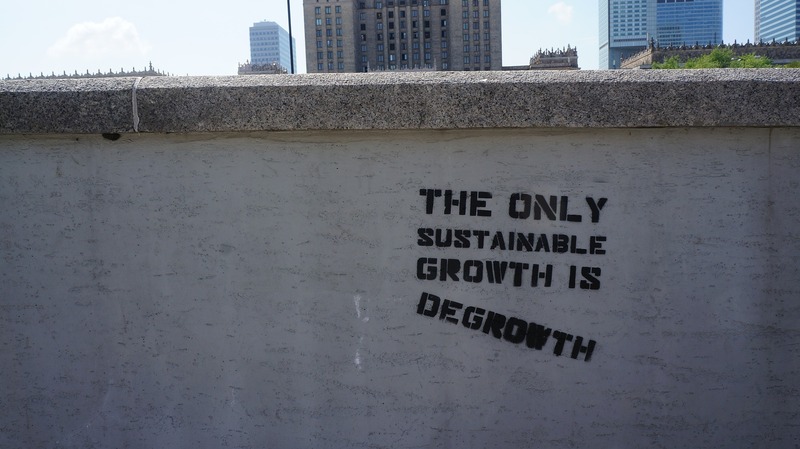 “Degrowth: A Vocabulary for a New Era”. Source: Routledge. The foundational characters of this specific idea of degrowth are clearly spelled out in the first part of the book, composed by four minifestos, namely “passionate declarations […] without the claim to grand theory or certainty that would characterize a manifesto” (p. 4). There are several essential features here. For example, the attempt to radicalize environmentalism anew by contrasting the process of de-politicization (if not outright cooption) of the movement in the 1980s and the support of so-called nowtopias, that is non-capitalist alternatives which are already present. Three other features are the critique of techno-fixing dreams based on increased efficiency; the refusal of a mythical Golden Age to return to by passively submitting to a putatively balanced “Mother Earth”; and the reversal of capitalist obsessions with scarcity through dépense. This term poses “excess” rather than “lack” as the crucial political issue of societies and suggests the unproductive expenditure of the economic surplus. and ecological economics, the situation of Greece conceived of as a paradigmatic case of the violence of austerity, concrete policy proposals – mostly developed within Spanish (Podemos) and Catalan (Barcelona en Comú) contexts – and an engagement with John Bellamy Foster’s eco-socialist position. From this perspective, I found particularly insightful Kallis’ suggestion to distinguish between throughput growth, capital accumulation and economic growth (as measured by GDP) in order to evaluate whether or not there is a growth-imperative inscribed in capitalist development. There is no doubt that more research is needed at this regard, especially since there are – in my opinion – more compelling eco-Marxist reflections than Bellamy Foster’s (I am thinking here of Anselme Jappe and Jason Moore, whose ecological re-interpretations of the tendency of the rate of profit to fall deserve careful consideration). Part VI of the book is titled “Conversations” and is composed by several discussants’ critical pieces followed by Kallis’ rebuttals. This is the place where the dialogical attitude I pointed out above is most clearly expressed and I really enjoyed it. In general, two criticisms seemed recurrent. First, the very term degrowth was questioned as considered for example “infelicitous” (Herman Daly, p. 145) or “not up to the task [of overturning the dominance of growth-centric economic thought]” (Kate Raworth, p. 179). Second, a certain lack of selectivity was detected: “we need fewer of the ‘bad’ things [which increase throughput] […] and more of the ‘good’ things [education, health care, arts]” (Richard Rosen, p. 151) or “equality, justice, quality of life” (Andy Stirling, p. 164). Although I must admit I am not a big fan of the word degrowth, I am convinced by Kallis’ reply that it is a “missile concept” aimed at opening up an unconventional space for discussion. More punk than cool, as it were. Moreover, I believe political subjectification depends much more on the desirability conveyed by a political struggle (with its conflictual processes and projects) than on the cognitive horizon evoked by a term. Similarly, I do not see any problem with Kallis’ response: once we decolonize our imaginary, the flourishing of positive values does not need to be framed in terms of growth – “[e]quality has to be achieved (or approximated), not grow” (p. 170). I would like to conclude this review, hopefully corresponding to the spirit of the book, by pointing out what I see as a crucial missing element in the degrowth debate – one that I believe could make more solid its grip on reality, both analytically and politically. Stefania Barca, in a recent post for this blog, argued that degrowth would greatly benefit from recognizing the importance of work and class for the transition to a post-carbon economy. I agree with Barca’s remarks and I would have enjoyed more thorough theoretical analyses of labor issues in the book. However, there are a few practical references to contemporary working conditions in the ten policy proposals (the second and third being work-sharing and basic/maximum income) and in the critique of Airbnb as a new way of exploiting social cooperation. Their connection is very important as it seems to suggest that basic income is not to be conceived as a mere welfare provision, but as the direct remuneration for productive activities which take place outside the traditional wage-form, which is to say beyond what Claus Offe defined the productivist nexus (full employment + perpetual growth) on which the welfare state is grounded. If this is so, than basic income incorporates what Autonomist Marxists call refusal of work, namely the disarticulation of the link between wage and income, or the critique of the Weberian Protestant (work) ethic. After all, and quite emphatically, Kallis says: “Waste ourselves and our products irrationally, refusing to improve and be ‘useful’, has its allure […] Let’s resist the demand to be positive!” (pp. 184-185). From this perspective, a political strategy for degrowth should simultaneously propose a critique of alienation (i.e. liberation of wage labor via workers’ control of productive processes), of the logic of value (i.e. liberation from wage labor via basic income or, as Christian Marazzi would have it, bio-income) and of the environmental negative impacts of their interplay (i.e. reduction of social metabolism). Such options may appear mutually exclusive, but I believe that a careful account (theoretical and political) of contemporary forms of exploitation can open up the space for their articulation. After all André Gorz, who is often mentioned by Kallis as one of the main precursors of degrowth, constantly strived to keep these three moments together in his research for an ecologically viable socialist strategy. Moreover, if we are to follow Aaron Vasintjan in his attempt to bridge degrowth and accelerationism – as I think we should –, then such a strategy may turn out to be particularly useful. This is just a half-baked thought, doubtlessly in need of further elaboration. What seems pretty certain, though, is that the involvement of workers – both waged and precarious – in the struggle for degrowth will prove nothing less than necessary. P.s. In defense of degrowth, written by Giorgos Kallis and edited by Aaron Vasintjan, can be downloaded for free here. A small donation to compensate editing and formatting work is kindly suggested. * Emanuele Leonardi is a Post-Doc Researcher at the Center for Social Studies of the University of Coimbra (CES/UC). His research interests include carbon trading and climate justice movements, working-class environmentalism, and André Gorz’s political ecology. dear Kai, I know the article you mention and I definitely agree it’s a very interesting one.